You can’t take him anywhere. And, he is leaving a trail of US diplomatic catastrophes even with close allies. 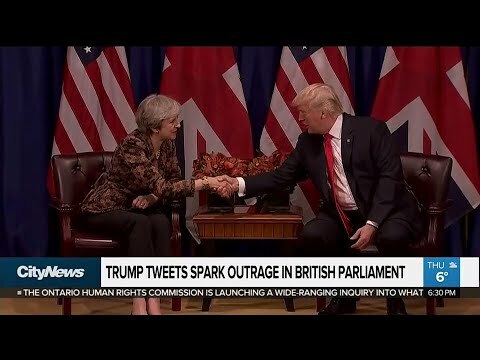 In the aftermath of massive and almost unanimous British outrage at Trump’s retweets of anti-Muslim hate videos (one phony and two irrelevant to Muslims in general) posted by the Neo-Nazi group Britain First, American diplomats have dropped plans for a working visit of Trump to the UK in January, when he was supposed to have inaugurated the new US embassy in London. Scores of members of parliament and London mayor Sadiq Khan, of Muslim heritage, have said that Trump is not welcome in the country. One MP suggested that if he did step foot on British soil, he should be arrested for hate crimes. US ambassador to the court of St. James’s, billionaire Woody Johnson, owner of the New York Jets, had urged Britons in September to get to know Trump.” “You’ll like him,” Johnson had promised. The ambassador is an heir of the Johnson & Johnson pharmaceutical company. Johnson appears emblematic of the moral bankruptcy of the 563-strong billionaire class in the United States, many of whom played important roles in giving us Trump, such as Bob Mercer, former CEO of Renaissance Technologies Hedge Fund (from which everyone should disinvest), and all-round funder of causes dear to the heart of any Nazi. Trump is in the process of rewarding the neo-Nazi billionaires by transferring another $1.5 trillion to them and taking it away from people who make less than $1 million a year. The January trip to Britain had been penciled in as less than a full state visit, which would have involved a meeting with the queen and would have likely put hundreds of thousands of protesters into the streets of London and other cities. I’m not sure the “working visit” ploy could have avoided sparking massive protests, either. I should be clear that Prime Minister Theresa May, an absolutely horrible person in her own right, did not cancel the Trump visit from her side, playing the role of lap dog to Washington just as Tony Blair used to. One question that could be posed is who did cancel Trump’s jaunt across the pond. It wouldn’t have been Rex Tillerson, since no petroleum seems to be involved and he is anyway a) not at Foggy Bottom much and b) probably on his way out and without much authority. Was it Johnson at the US embassy in London? If so, maybe he has rethought his advice to Britishers to get to know Trump. Trump is like Bertha Mason, the violent madwoman in the attic in Charlotte Brontë’s Jane Eyre. It is better she isn’t seen or heard by the house guests. Unfortunately, Bertha did eventually manage to burn down her estranged husband Edward Rochester’s house, as Trump is doing to the United States.